You'll need a gown for your graduation ceremony. Find out everything you need to know about your gown, how to order and if you need a hat. You will need to wear a University of Bristol gown. You can buy your own gown, or hire one for the day. Prices to hire a gown start from £45. You may be able to apply for a Graduation Bursary to help you cover the cost of gown hire. If you are graduating with another award, such as a Bachelors, Masters or Doctorate, you do not need a hat. Ede & Ravenscroft will give you the option of buying a hat, but this is not a requirement. There will be hats available for you, on the day, to wear in official photographs. You need to order your gown, and hat if applicable, from Ede & Ravenscroft. Their website will guide you step-by-step through the ordering process. Make sure you enter your institution, ceremony event details and your award (degree course) correctly. You can order your gown between Wednesday 17 April to Monday 8 July. You will not be able to graduate without the correct gown. 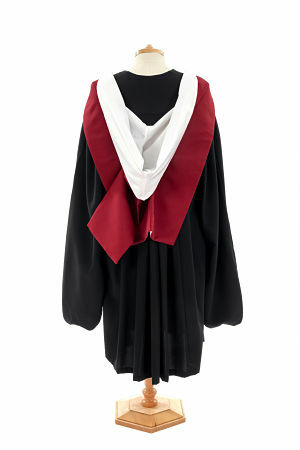 Undergraduate and Master's gowns are black, with a draping known as a hood. The colour of your hood depends on your degree. If you are graduating with a BA, BSc, BEng, BDS or BVSc you will have a red hood. If you are graduating with an LLB, the red hood will have a violet trim. If you are graduating with an MBChB your hood will be red with white trim. If you are graduating with a Masters, you will have a red hood, with a white lining. Postgraduate doctors wear a scarlet gown with a dark violet facing, sleeves and hood lining. Higher doctorates wear a scarlet gown with salmon-coloured facing, sleeves and hood lining. You should feel comfortable in the clothes you choose to wear. Most people decide to wear something smart that reflects that this is a special and more formal occasion. Traditional dress is also acceptable for graduation. Read our timetable of the day to find out where and when you need to pick up and drop off your gown. When you hire or purchase your gown, Ede & Ravenscroft will also give you the option of buying an official photography package. Options range from a basic pack to multiple photographs in high-quality frames. Ordering prints is not a requirement. Find out more about your options, or contact Ede & Ravenscroft. 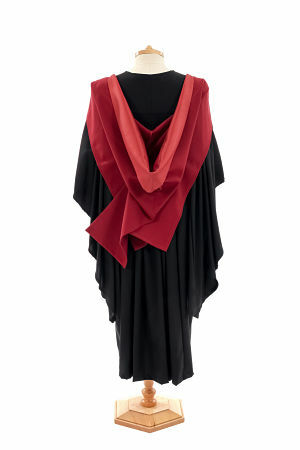 The back of the BA or BSc gown, showing the red hood. The back of the Masters' gown, showing the red hood with the white lining. Back of the Higher doctorate gown, showing the deep red hood and lining.